It seems that the unexpected hobby break is much longer than I hoped for. With no new games yet scheduled (entirely my own fault :( ) I decided it may be a good idea to write a short post about a few things that did happen in the meantime. 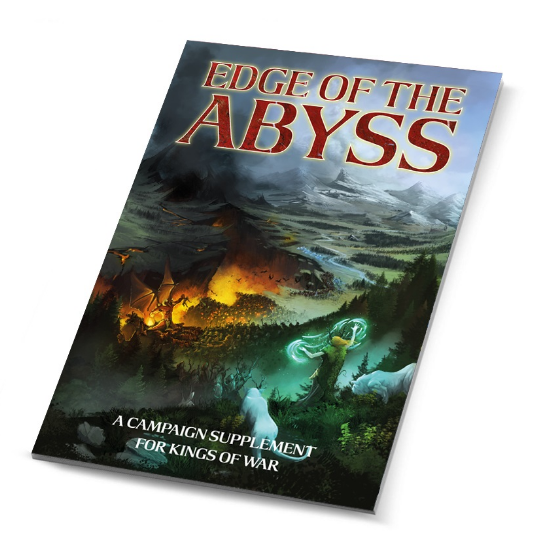 And to let you know I will do my best to get back to the regular posting about Kings of War! I am also entertaining an idea of more recent short posts as I have seen that on other blogs and websites where the authors simply briefly discuss a topic. It sounds like a good idea to keep the blog updated and put some thoughts in writing. And with a busy schedule it may be a better way of staying in touch with the hobby! 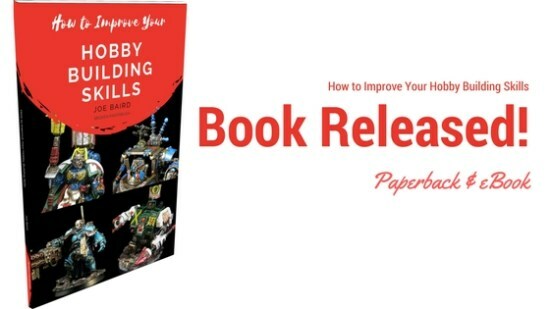 I would like to start with the book written by Joe B., the fellow hobbyist who is amazing at bringing various players and painters together and who is very well known thanks to his amazing Broken Paintbrush blog. I highly recommend that book because it brings a lot of good ideas together. If you are a beginner this book will help you a lot with some good practice and good habits to be gained. If you are a pro you will find it useful to remind you about some fundamentals. And all would benefit from a large amount of links to some great websites and blogs. That is a fantastic book, Joe! Thanks a lot and sorry for such a brief review at this stage. Despite lack of hobby time I still tried to do something and I was very happy to finish the first troop of Palace Guard. I am in a very comfortable situation where I have enough painted models for the current army. However, I also have quite a number of great models that are still unpainted. I decided some time ago that I will paint new models in the improved color scheme and start replacing old units with new. 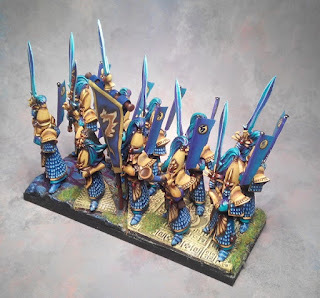 In this way I can still play games with painted models, do not rush the painting to do it on time before a potential event I want to attend and keep multi-basing. I also experimented with the back banner for the infantry models to make it a common element among the units in the army (heavy cavalry has those) and to distinguish the models a bit more as I have not converted them at all. I am very happy with the effect and I have already started painting a second unit. 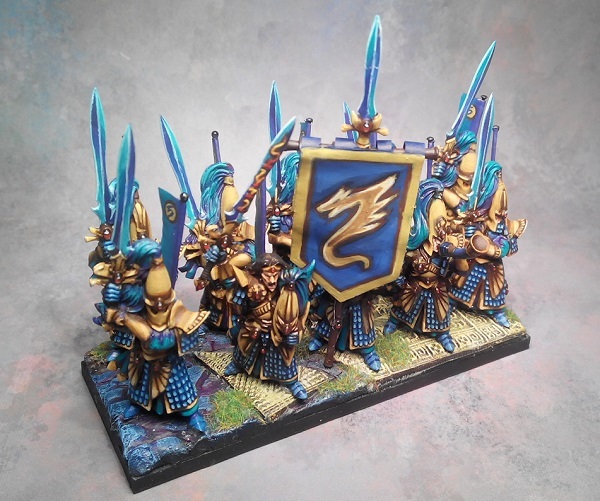 However, I really need to exchange the banner and I will do so while painting it for the second unit. I am really looking forward to this campaign. I am not sure how much time I will be able to allocate to games but I am very interested in the story line and the development of the world of Mantica due to this important event. One of the interesting elements that are also introduced for the games in that campaign are formations. It is a new concept for Kings of War and it means that if you take certain units then at an additional point cost these units gain special ability. 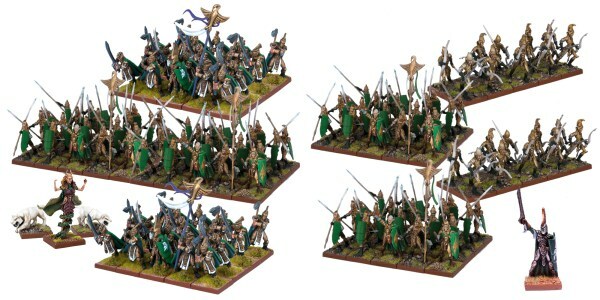 Honor Guard of the Green Lady (left) and Kindred Borderguard (right) formations for Elves. It is definitely an exciting time for Kings of War enthusiasts and I hope that the upcoming months will help the game grow even further and that more and more players will pick it as their main system. 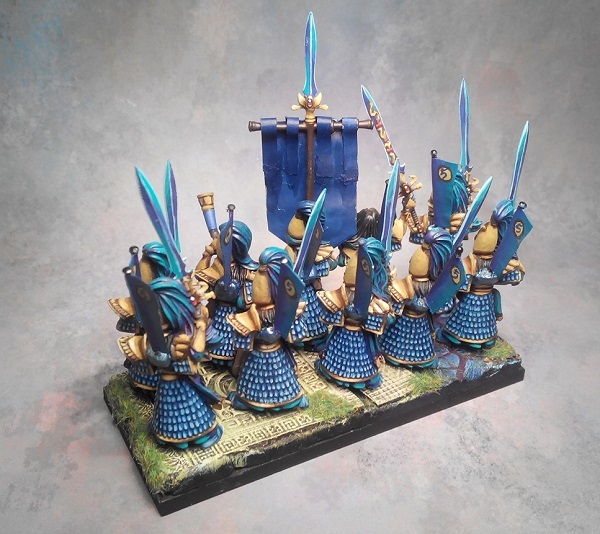 Awesome work on the Palace Guard, they look fantastic! The elves look wonderful! And thanks for the shoutout, I'm glad you enjoyed the book! I got distracted with #New40k and haven't written anything on the painting book for a while. The new Kings of War stuff looks really interesting. Thanks, I am really glad you like my new unit with very popular miniatures. I like them a lot and I think I finally have a great opportunity to use the unpainted ones for a completely different type of a unit. Also, multi-basing is definitely an experience worth pursuing. I noticed you are painting a lot for 40K! Some nice models indeed and I am not surprised they attracted your interest. The amount of painting you did in short time is truly impressive!